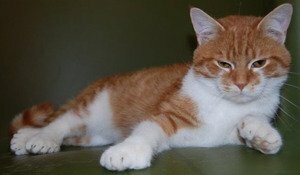 An animal shelter in Milwaukee, Wis., is using a 26-toed cat named Daniel to help pay off the no-kill facility’s re-location expenses. Daniel (see video below) was to be euthanized at the Milwaukee Animal Control Commission due to overcrowding and lack of resources, but was rescued by an animal rescue center. Daniel was to be euthanized, but was saved by Amy Rowell; the cat has seven toes on each front paw and six on each back paw. Little did the rescuers know at the time that Daniel would be the facility’s savior. The Milwaukee Animal Rescue Center, which saved Daniel, moved from a mall to a new location last October when its lease was not renewed. Strapped for cash, the shelter used Daniel and a unique donation plan to raise funds, as it urged people to give $26 – one dollar for each of the cat’s toes. The shelter reached its goal of $100,000 for the down payment on the new facility, but needs to raise $110,000 more in order to pay off the balance. Donations have come from worldwide sources. Ironically, Daniel’s rescue almost never happened. When Rowell initially went to animal control, it was to pick up another cat. While she was at the facility, Daniel put his paw through the bars of his cage and touched Rowell’s head. Cats typically have 18 toes – five on each front paw, and four on each rear paw. Daniel has two extra toes on each foot, and is two toes shy of the world record. The feline is the Center’s mascot. Anyone interested in Daniel and the Milwaukee Animal Rescue Center should take a look at the organization’s website.